Wow. Check out the HUGE penthouse in NYC that the Live! With Kelly and Michael host Kelly Ripa and her husband Mark Consuelos are selling for $24.5 million. The place they’ve called home since 2005 has a whopping 6,792 square feet with 5 bedrooms and 4.5 baths–plenty of space for their 3 kids to run around. I used to watch Kelly and Mark on All My Children, back when my son was little and I was home alone with him all day. I’d look forward to taking a break with my Pine Valley friends every afternoon at 1:00. Want it? Zillow has more info about the Crosby Street penthouse. The property is co-listed with Adam Modlin and Raphael De Niro of Prudential Douglas Elliman. I am trying so hard to wrap my head around the cost of $24.5 million !!!!. Soho might be someone’s dream location but for my dream home give me green grass, trees, a pond, & no neighbours. That’s right! A pond the size of the Pacific Ocean. Oh what I could do with a $24.5 million real estate budget . . . . . . This place overall is fine, not my thing but nicely done. But the staircase looks like a huge eyesore to me. Am I alone here? No. You are not alone. The railing on that staircase looks like a fence for a commercial building. The industrial look has its place but this is a very heavy handed use of it. That house is beautiful!!! I love her red accents. The amazing dining room table and chairs caught my eye. Also the big Marilyn poster. The deck is gorgeous and the location is stupendous. I love NYC-favorite city by far. My biggest unanswered question is… why sell it? Any idea why? Did they sell their Franklin Lakes house? I grew up there. Perhaps that is why they’re moving… Not enough Electrolux appliances in this set up! Not my thing at all. I just don’t get wanting to live in a hotel/night club setting. I wonder what it looked like before the renovation. 24 million? I wonder if they’ll get anything close. I can’t get past my personal feelings about her, in order to give an unbiased opinion. Overall I just don’t like this at all. New Yorkers are used to huge price tags but where they balk is at the monthly carrying costs; some buildings have huge maintenance fees, especially common if the building is small, and downtown where there is often a land-lease situation, when the building owner/developer doesn’t own the land on which the building sits. Even if a buyer can afford the sale price of this penthouse, the monthly carrying costs are pretty steep. That doesn’t include what it costs to garage their cars, electric and cable bills, house keeping….the basics. In other words, I won’t be submitting a bid. Agree with Jen M that the staircase overwhelms the room. I think it’s amazing and if you have to live in the city (or want to) that’s the way to do it! The outdoor space in SoHo alone is worth the big bucks!!!! Any idea where they’re headed? I know that they have the place in the hamptons but I would imagine they’ll stay in the city…. Remember Kelly when she first showed up on AMC as the rebellious teen. I have to agree that it does not look like a family with small kids lives there. I expect at least some of this is staging. The only thing I loved was that dining room table, the rest just looked generic high end. What’s with the creepy gallery shot of Marilyn Monroe? Yikes. This place has no appeal to me – whatsoever. I cannot imagine buying a home that expensive without a lake and acreage for that price tag. Guess I’m in the minority … I think it’s absolutely stunning! It’s not my taste by any means, but I think it’s gorgeous! And I happen to love the staircase! I wouldn’t want to live there permanently, but it would be fun for a vacation. I do like elements of it. The skylight, the shape of the dining room chairs (though no fire engine red please) in the second dining room, the private roof deck, and so on. With her work in NY and a largish family this is the best case scenario of living accommodations I would think. And if you want to make the big bucks in the big apple your going to have to pay the big bucks for a place to live. I love the apartment and the pops of raspberry. But I’d bet it is staged to sell. Its a great space and all the outdoor space is awesome and looks somewhat private. I wonder where they’re going? Euwww. . . I can’t find a thing to like about it. Perhaps the bathtub and all the light. It just doesn’t look the least bit warm or inviting. This isn’t my style and I wouldn’t want to live here, but I will say it’s nicer than most penthouses I have seen. not sure why they’d want to sell, except the price tag or taxes!! ….luv this place! I recognize the kitchen from once or twice when we saw Kelly at home making holiday meals with the family. We once saw Regis drop something heavy on that dark wood floor near the entry and chip a notch into it, much to Mark’s dismay. It’s a nice place and that outdoor space certainly is a premium in NYC. People like them with large incomes coming in always need good investments and there’s nothing better than investing in your own home. I wouldn’t be surprised if their new home costs a good bit more than that. Since the show is doing very well, they’re not moving far, I’m sure. I really hope it’s just staged. Imagine being a little kid and trying to eat our breakfast while a big scary poster lady is having a nervous breakdown on the wall. I would be worried that somebody is going to slip and impale them self on those stair rails. Chilly, chilly place. Hilarious! I thought the same things! I love Kelly. That place is awesome!!!!! 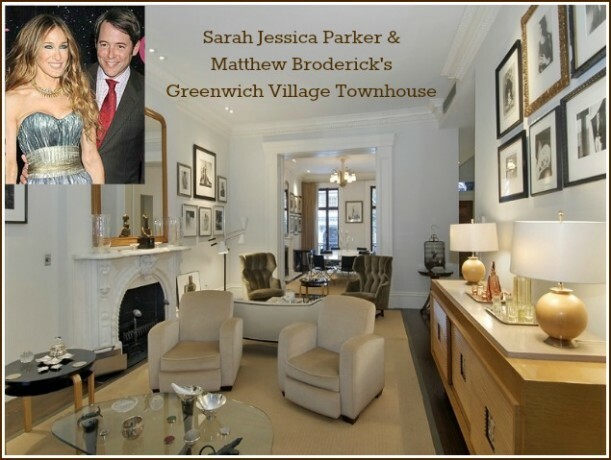 Of course its staged to sell… it shows just the way an upscale SoHo apartment should to appeal to buyers in that market. I love it (except for the depressed Marilyn artwork). Where the heck are they going after this place? I agree with what looks like the majority – too cold looking. Don’t get me wrong, it is lovely. I’m just a small town,cottage kind of gal. The breakfast table is gorgeous. The outdoor space is to die for. But all-in-all, if I had 24 million to spend, this would not be it. As tiny as she is, doesn’t she freeze to death in this place? Raphael De Niro is Robert’s son, correct? I remember when he was born so I definitely remember Haley and Mateo! When the character first appeared she had black hair and was supposed to be street tough. And I think Mateo was known as Matt in the very beginning. My brain is filled with lots of useless information! correct. she was a mess and her uncle trevor the police detective/ex-mercenary, had to clean her up. Anyone who has followed the real estate history of Kelly Ripa and Mark Consuelos knows that this penthouse is exactly their style – it has not been staged at all. Their past real estate listing photos, etc, have shown exactly the same interior design taste: minimal, neutral, pops of red. I find the space calming and gorgeous; but more than that, I wanted to just say that yes, this is their space as they lived in it. Well, I have to admit this is certainly not my style, but it is interesting to see none the less. Julia, I, too, loved watching “All My Children” and remember Haley first arriving on the scene with her black hair and street toughness! I really enjoyed the banter between Kelly and Regis. She seems so warm and friendly, that I am surprised how differently I IMAGINED they would live. I guess, after reading the other comments, I was just WAY off in my perception! Having an actress daughter living in the city, we have considered purchasing rather than renting. We will NOT be looking into this one!!!! What appeals to us is something charming on the Upper West Side, a la “You’ve Got Mail”! I think it is a beautiful home! And I’m a shabby chic girl. Picture it full of kids and friends. This is just staged for real estate. I wonder where they’ll move. By “staged” I mean, no dirty soccer socks or back packs in pics. Both of them have a sleek, minimalist style. as a new yorker, i’ll take it. location, space, skylights!, outdoor space and privacy. you can put whatever kind of decor you want in it. i’m going with eclectic bohemian. and i’ll hang some some nice dhurries from that ugly staircase to cover up the spikes. all good. Love to see the great peeks you offer into these amazing homes! Doesn’t matter if I like the style or not.. the tours are wonderful and I can appreciate them, even if it’s not to my taste. Thanks for the look inside!! Yeah, count me in for that, too! Ha. I love the pic of Marilyn! It seems the ONLY fun whimsical thing there…and with 3 kids! It is definetly staged, and too sterile for a “home”. for me. It looks like a home for an Urban young couple, even the furnishings, look that way. Beautiful yes, but for 3 kids..nah. Now the outdoor space, maybe..but still. I wondere WHAT it looked like BEFORE the reno..any pics on that?? This is really surprising, and not at all what I pictured Kelly and her family living in. There’s nothing inside that appeals to me at all! Too modern and cold. I do like the warmth of the exterior. The roof top deck is amazing, and doesn’t feel like you’re in NYC at all! I think if I had the means and wanted to live in that location, I gut it, and return it to its pre-war elegance and charm. Well, I do love the outdoor space. That looked cozy and inviting. The interiors feel really cold and hard to me, though. They all seem filled with sharp edges and nothing soft to warm things up a bit. I wonder how much of that is the staging and much of that is their actual taste? Of course, I don’t have that kind of budget and even if I did, I wouldn’t want to actually live in the city. I wonder what the general demographic (those who might really consider buying this property, I mean) think of this place. Or do they just look at the unchangeable elements (like location) and go in knowing they might do a complete reno? Since I am far-removed from this set of folks, I can’t really say. I have a young family and I could totally see us living here! Love it! Glad to see it’s not “cookie cutter” like all the L.A. homes you see. Thanks for sharing. I can’t stand Kelly Ripa and can’t figure out why she is even on TV. I like modern but this place gives me the deep chills. The picture of Marilyn Monroe at one of her worst times is another downer in the place. Okay…I will be the dissenter here. I like it! Though it doesn’t look like a family home now, I am sure that they had stagers come in to prepare it for photography. Actually this would be a dream empty nesters home for hubby and me. We lived in loft apartments when we were a young couple, then houses and now dream of living the loft life again- but with more money and style hopefully! That’s my two cents. Sorry, but $24.5 million for that!! I agree — give me trees, grass and mountains. I’ll even take a pond and a hill. I don’t get living cheek-to-jowel the way NYers do while paying extraordinary amounts of money to do so. I lived there for three years and couldn’t wait to leave!! Well, yeah I have to agree with you guys about the “fencing” by the stairs. It does not complement the rest of the modern contemporary interior and kinds of reduce the beauty of the overall layout. I have to say that $24.5million is a little far-fetched for an average interior design of this house which is actually quite a common design and nothing so special about it, except the fact that it is a celebrity house. Or perhaps because the house is fully-furbished with expensive furnishing. Great for owners who wish to move in directly and have not many items from previous house or their storage units. Why does one of the couches have its back to the TV? It looks cluttered and somewhat not well thought through. Anyway, who am I to a 24 million abode? I love it! All of it! Gorgeous!! I think there are some jealous people on here making their negative comments. They are selling it for that because of the money they have put into it and they deserve to make a profit!